Search Group is pleased to offer this low-budget, entry level search marketing plan on Google Adwords for local Perth businesses. Google Adwords is a Pay-Per-Click (PPC) advertising option where text adverts appear on the Google.com.au search engine and related Google sites, at the top and bottom of the Search Engine Results Pages (SERPs) in response to the keywords typed by the consumer search query. Consumers click on the advert, links, phone number displayed, or directions to your business, to then engage directly with your business. Clicks cost based on the bid amount for the keyword. Search Group manages the Google Adwords management process for your business, setting up the Google Adwords account, Ad Groups, Adverts, selecting targeted keywords, setting the target location, adding suitable ad extensions, configuring tracking through to your website so that we can measure the effective Return On Investment (ROI) of your online advertising campaigns. New to Google Adwords? As we are a Google Partner Agency, when you spend your first twenty-five dollars of AdSpend budget in Google Adwords with us, you will receive a one-hundred dollar AdSpend credit in your account. 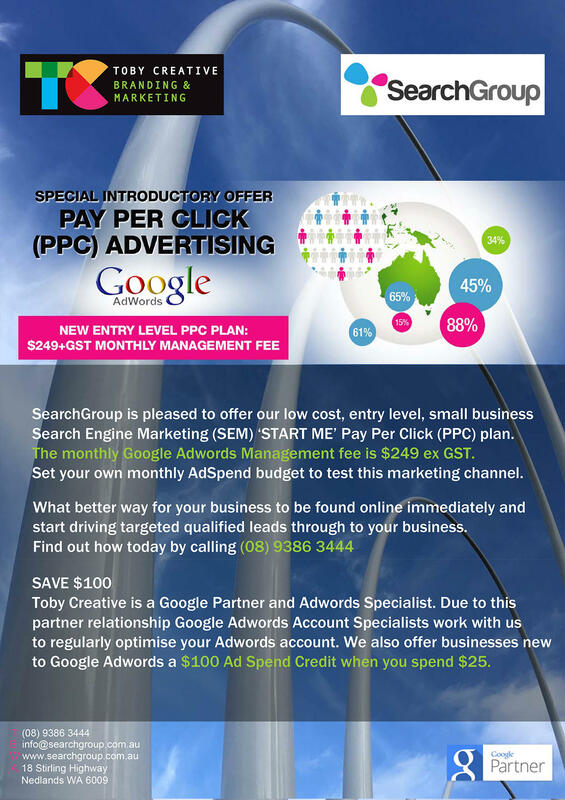 Download or print-out, our Search Group Google Adwords PPC (Pay-Per-Click) Start Me brochure, then either call us on (08) 9386 3444 to book a no obligation free initial consultation at your location so that we can discuss your specific requirements, or fill in our contact form on this page to send us your details and we’ll contact you back. Ask for our FREE website SEO report to find out the current status of your website and which areas can be improved.